October is Respect Life month. Often when we think about respecting life we first think of the fight to save babies and to end abortion. It is right that we think of this first, as without our basic right to life, we literally have nothing. However, right to life and respecting life doesn’t end once we save all the babies. If we ended abortion today, our fight would still be far from over. The life movement starts with protecting the lives of the innocent in the womb, but it encompasses so much more. Our faith teaches us that each person should be treated with love, respect, and dignity. It doesn’t matter where we come from, it doesn’t matter what our skin color is; it doesn’t matter our gender, our age, or our religion. Each and every person, because they are made in the image and likeness of God, deserves to live a dignified life. It is important to remember that each life we encounter is sacred and has value. The fight for life begins in the womb, but it does not stop there. The fight for dignity and respect of life doesn’t end with end of life issues like assisted suicide or dignity in death. No, in between the two dots of conception and death on our timeline of life, are various other life issues that deeply affect a person’s ability to live a dignified life. Catholic social teaching tells us that we have to defend more than just the unborn and the dying. We must fight for those who are suffering because they are poor, hungry, thirsty, homeless, or abused. 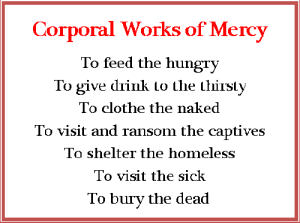 We can look to the Corporal Works of Mercy to remind us of Christ’s social teachings about these groups of people. We must reach out to those who are suffering because they don’t have adequate means to sustain themselves. We must provide care for those who are unable to care for themselves. 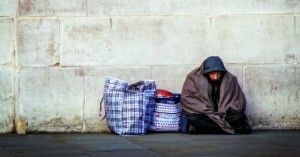 Catholic social teaching does not end at feeding the poor and homeless. It extends much further into the depths of our society. If we are truly inspired to protect life and help all people to live dignified lives, then we must be willing to tackle issues like human trafficking, capital punishment, securing the rights of the disabled, making mental and physical health care available to all, insuring just wages, and supporting immigrants who come to our country to seek a life free from the fear of death or persecution. Many of these issues are hot button topics that tend to instigate arguments and divide otherwise very compassionate, level-headed people. Even if we fear stepping out to defend life in these circumstances, we must do so. If we don’t, we not only disrespect the lives made in God’s likeness, we disrespect God Himself. Each person deserves life; but life is more than just being allowed to born. Yes, we must save babies! Not only is it honorable to do so, but it is vitally important! But after this we must continue the fight for life. We must fight for the rights of everyone to be able to eat, work, provide for their families, worship God in the manner of their choosing, and to live without the fear of being tortured, abused, or violated. We must fight for the disabled, the imprisoned, and the dying. We must defend the sick, the poor, the marginalized, the disabled and the immigrants seeking a better life. We have to acknowledge that if every person is made in the image and likeness of God, then every person deserves our love, our respect, and our protection. As we continue to celebrate and defend life in October, we must ask ourselves if we are willing to stand up for all people. Are we only comfortable with defending helpless babies in the womb and those who are dying? Are we willing to defend the lives of those who cross our borders seeking to protect their children from the horrors that they are faced with in their native homeland? Are we willing to seek out a stay of execution for a convicted murder on death row or to make sure that those who are behind bars are able to live a dignified life? Are we willing to be the voice for the mentally ill, the disabled, and the poor? To call ourselves pro-life we must acknowledge that life issues begin in the womb, but they extend far beyond the womb. We must be willing to fight for all life; anything less is not acceptable.